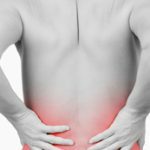 Home / back pain / What is Radiculopathy? Radiculopathy is a term used to describe irritation of a nerve root from the spine; this irritation can occur due to pressure on the nerve from surrounding bones and ligaments, or it can be from chemicals released after an injury such as a disc herniation. When nerve roots are inflamed, one can experience pain, numbness, tingling, or weakness in a particular place in the arm or leg. There are several different types of radiculopathy, named for the location when the compressed nerve occurs. Cervical radiculopathy is the term for pressure affecting the nerve root in the neck, causing painful burning or tingling in the arm or fingers, or even under the shoulder blade. Lumbar radiculopathy is the term for pressure affecting the nerve root in the lower back. This form of radiculopathy is commonly called ‘sciatica,’ or pain shooting down the back of the leg. Thoracic radiculopathy is the term for pinched nerves in the center portion of the spine, causing pain in the chest and torso. This form of radiculopathy is much more uncommon that the others, and may be mistaken for shingles. There are multiple causes of radiculopathy, some of which are changes or injuries that happen suddenly to compress or irritate a nerve root, while others are changes that gradually happen over time, pinching the nerve until it becomes irritated. The most common cause of a sudden compression of a nerve root is a disc herniation. Discs are the cushioning between the bones, or vertebrae, of the spine, and act as shock absorbers. They have a tougher outer rim and then a softer interior. If the rim of the disk either weakens or tears, allowing the softer disk material to either push the rim out and create an outpouching of the disk or even allows pieces of disk to come out from the disk space entirely. The disk outpouching or piece of free (also called ‘extruded’) disk can then press on a nerve, causing irritation. Radiculopathy can also be cause by changes that occur in the spine as we get older. As the spine ages, changes occur such as enlargement of the small joints that run along the back of the spine and bulging of the discs as they flatten out-which is different from the sudden weakening in one small part of the rim of the disc that leads to a herniation! The bone spurs off of the small joints of the spine and the bulging of a disc can both gradually decrease the space that a nerve can travel through. Eventually, if the space becomes too small over time, the nerve root will get irritated, resulting in radiculopathy. Radiculopathy symptoms can be mild to severe, with the location of pain depending on where you’re experiencing a pinched nerve in your lower back or neck. For instance, when you report to your spinal surgeon that you have more pain going down your lower arm, that could be due to cervical radiculopathy of a particular nerve. If you tell your spinal physician about pain going down into your lower leg, that may be lumbar radiculopathy from a specific nerve root. If you have symptoms that you are concerned might be radiculopathy, the most important thing is to try and figure out exactly where the numbness/tingling are located or where exactly the pain is traveling. Of course, arm and shoulder pain can be common symptoms of a heart attack as well, so if you have any sudden, severe pain in these areas, call for emergency help. 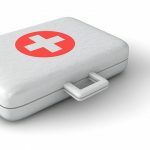 It’s better to seek help for a potential emergency and find out it’s just radiculopathy than to shrug off your pain symptoms –self-diagnosing radiculopathy incorrectly and dangerously! Don’t delay in contacting your spinal physician when you experience possible symptoms of radiculopathy, since this is a condition that can be treated for your comfort and well-being, even without surgery much of the time! Your spinal surgeon is the best suited to determine what the source of your pain might be and come up with the right treatment plan to help you feel better.